Should You Worry About an Accident With an Uber or Lyft Driver? A NerdWallet analysis of a recent survey of people who drive for companies such as Uber and Lyft has found that it’s the rideshare drivers — not passengers or other drivers — who could face the most financial risk in an accident. According to the SherpaShare survey of 1,022 rideshare drivers, 77% haven’t purchased additional ridesharing insurance coverage beyond what’s offered by Uber and Lyft. The companies offer coverage of up to $1 million in an accident, but only when drivers have a passenger in the car or are headed to pick up a rider. When a driver is waiting for a fare, that coverage drops to a maximum of $100,000 per accident to cover liability for injuries. Still, this is often double the amount of liability coverage carried by the average U.S. driver, says Robert Passmore, assistant vice president of personal lines policy at Property Casualty Insurers Association of America. To put rideshare insurance coverage in perspective, only two states, Alaska and Maine, require all drivers to carry at least $100,000 in liability coverage per accident, matching the minimum that Uber and Lyft provide. Other states require less — as little as $30,000 per accident in some places. Meanwhile, at least 12% of all U.S. drivers go without any insurance coverage at all, according to the Insurance Research Council. In most cases, if you’re in an accident where the other driver is at fault, you are better positioned to be compensated for injuries and damages if that other person is a rideshare driver. And depending on the state and accident, you may be able to sue the rideshare company for damages beyond the policy cap. To make sure you’re adequately covered in any accident, evaluate your own policy. It’s a good idea to carry coverage in case of accidents with uninsured or underinsured motorists, and some states require it. You can tap your UM or UIM coverage for expenses that go beyond the coverage of at-fault driver policies. “The best way to protect yourself is to make sure you have high UIM coverage,” says personal injury attorney Patrick Salvi II. The risks of rideshare drivers going without additional insurance coverage is largely theirs alone. According to the survey, 31% of those without additional coverage said they were comfortable with the policy limits provided by Uber and Lyft, while 40% indicated they would be shopping for extra coverage in the next three months. Rideshare drivers might not realize that if they get into an accident while waiting for a call, neither Uber nor Lyft will cover damage to the driver’s vehicle. And some insurance companies might balk at paying if they weren’t aware of their customer’s rideshare driving. 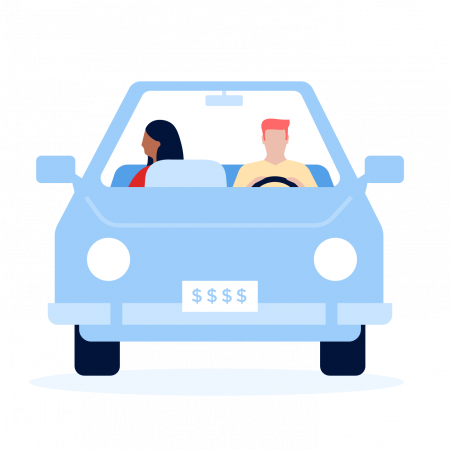 NerdWallet, a personal finance website, analyzed the data from SherpaShare, an app that helps 50,000 rideshare drivers track mileage, earnings and expenses. The survey of 1,022 SherpaShare users was conducted Jan. 26-Feb. 9, 2016, through the app and company blog. Elizabeth Renter is a staff writer at NerdWallet, a personal finance website. Email: elizabeth@nerdwallet.com. Twitter:@ElizabethRenter.